Years 1 & 2 enjoyed a special assembly taken by Year 7 pupils, Eva Z and Ella B, at which the older girls explained how to use the technique of PBS (pause, breathe, smile) to calm down and settle one’s mind. 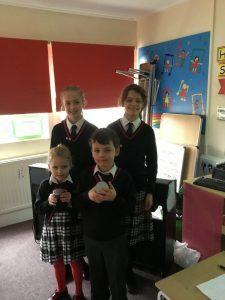 Eva & Ella were both very able and calm themselves, and used power point as well as some jars filled with glitter to demonstrate how thoughts and feelings can be swirling around, but given a few minutes can calm down and settle. We loved having some ‘old girls’ back in the Pre-Prep and were most impressed with their professionalism!